How do you make 21 pond hockey rinks with all this snow? GRAVENHURST — Cold and snow are a welcome combination for some winter enthusiasts. For Devin Morley, he prefers the former to the latter. In fact, he loves the cold and hates the snow, because the owner of Local Landscaping has a crew out on Lake Muskoka making 21 ice hockey rinks. 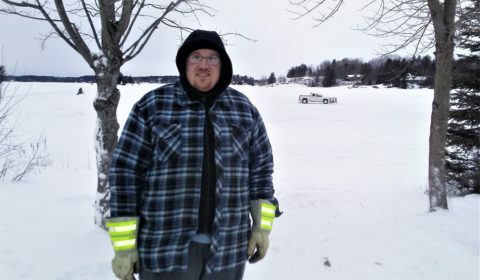 Devin Morley, owner of Local Landscaping , has his pickup truck and crew safely out on Lake Muskoka on 20 inches of ice making 21 pond hockey rinks for the Feb. 9 pond hockey championships at BP. On Feb. 9 they have to have the rinks ready for the annual weekend pond hockey competition at Boston Pizza. That means clearing a ton of snow. To do that Morley had one of his pickup trucks out on the lake Monday, a garden tractor and an ATV — all with plows — clearing the small acreage. Last Friday they had their big auger out checking the ice thickness of the ice, which Morley said Monday was about 20 inches. Enough, he said with a laugh, that he didn’t have any trouble safely sending out his driver in a white pickup truck. They have two weeks to carve out the rinks, each 70×90 feet large. But it’s the snow that keeps piling up that’s the problem. After 2019 starting off with an almost clear, pristine lake surface, perfect for shinny, the recent cold was evened welcomed by Morley’s company. But then the snow fell. Luckily that actually makes it easier to divvy up the frozenness into suitable squares. Put out the boards and bring in the sweeper brushes and flood the rinks. Then it’ll be up to Mother Nature to take care of the rest. And for organizer Rob Carlton’s turn to bring in the teams of players. Then it’ll be game on Friday, Saturday and Sunday. Devin Morley puts down a sheet of plywood to help get a tractor up the hill to the parking lot after clearing snow.